Spring is here! I am getting all fired up. I dream all winter long of topwater strikes and stripping big streamers for predators. Often in this largemouth and smallmouth bass species world it's easy to be clouded into thinking that all strikes are violent and unmistakable. I find it virtually impossible to convince many fly anglers that a bass can inhale a popper as delicately as a rainbow sipping a caddis. Or what about when the streamer you're stripping suddenly disappears out of site. Where'd it go? I didn't see a fish eat it. 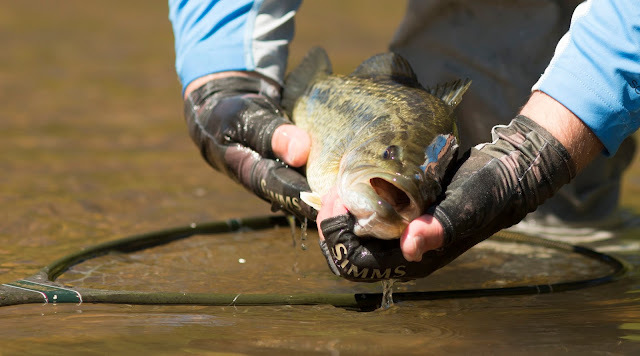 Now take a look at slow deep water presentations with weighted flies. This is a place I see many anglers get completely lost and miss strike after strike. I wish to expose some of the behavior of these predators and share some insights to my success that I've learned over my many years of chasing bronze donks and ditch pickles. Be attentive! Don't assume every topwater strike is going to be explosive. Yeah, most of the time they are easily discernible but I've witnessed flies pulled under without so much as a gulp, swirl, slurp or water ring. On calm, silent days, I've glanced away for a moment only to look back and not be able to locate my fly. Within moments I've watched as the fly resurfaced from the depths after the predator let go realizing it wasn't actually food, meanwhile not so much as a disturbance was created in the process. I've witnessed this too many times and have learned the hard way to remain completely attentive in watching for any activity in the area of my fly. Besides an explosion, watch for any water movement including pushes and swirls. Depending on your view you might see a shadow appear behind your fly. In whisper quiet settings listen for a slurp or gulp. If you get a swipe and refusal change your fly. Believe, every well placed cast will lead to a strike, keep your eyes focused on the fly and your success will improve. I like to fish a streamer I can see. More often than not my streamer choice will be white and flashy and includes flies such as clousers, feather game changers, deceivers, and most anything articulated. Detecting streamer strikes is either by site or by feel. I prefer to have visual site on my streamer and see the take. Bass can approach in various ways. Watch for follows, watch for swipes, watch for them to missile up from the depths but most of all watch for your streamer to just disappear. Many times I never see the fish but know I've been struck because my streamer that was just in sight suddenly disappeared. Just like topwater, streamer fishing for predators requires you to remain completely attentive. Keys to success... Keep your rod tip low and pointed toward the fly. Remain connected to your fly with a taunt line even if you are pausing your strip. Always use a strip hook set. Stick to these techniques even if you can't see your streamer. Strikes can be detected by site, line movement and/or the feel of your line coming tight. Greg's Tip of the Day... Hook sets are free, all day long! It's much easier to accept setting a hook into nothing than the feeling of not setting the hook when you realize your doubt was a real strike. While topwater and shallow streamer strikes are mostly visual let's take a minute and talk about deeper water fishing for the bass species. Detecting deep water strikes comes with a whole other set of rules. If you're not tuned into this type of fishing, strikes may be going unnoticed. Generally deep water bass strikes are non-violent. Much of the time a strike can only be detected by a slight tick in your line and/or maybe your line moves off in a direction different than your retrieve. It's very important to keep the slack out and try to maintain contact with your fly. From a boat I forgo the sink tip lines and instead use floating line with long leader. I believe a weighted fly sinks faster on a tapered leader and the floating line gives me a sighter. Adding a small sighter/indicator can really help in strike detection. An indicator should not restrict a fly from sinking and only serve as a sighter. Besides providing strike detection it should also serve as a depth finder. In this type of fishing most strikes occur when your fly is on bottom, let this be what you are trying to achieve. When fishing this technique the flies I like are weighted clousers, crawfish patterns like Creek Crawler and heavy bunny style patterns like Dali Lama. Be less concerned about fly animation and more concerned with the fly reaching bottom. Fish close and keep your cast close. Think vertical presentation. Bass, especially smallmouth, don't like direct sunlight. When the sun is high they will retreat to the shady bottom side of boulders, banks, logs and any other light relief structure they can find. Get a fly in those shady depths and you will find predators. The more I understand the nature of predator strikes the more I find success. I hope these tips will help you get connected to your predator instincts and translate into success. I'll see you on the water...But you probably won't see me! "Passion For Fishing Is A Lifelong Pursuit Of Discovery"